Alvor is one of the finest resort towns of the Algarve, and is the ideal destination if you are seeking a relaxed, beach-based holiday. 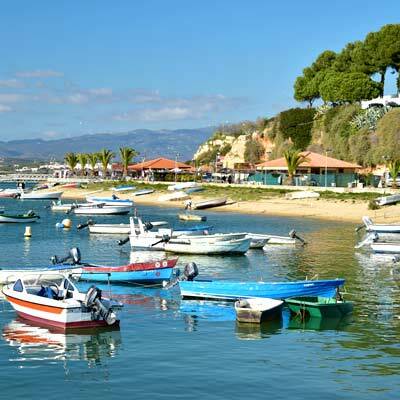 Historically, Alvor was a fortified town and fishing port, which today has developed responsibly into a charming and mature holiday destination. 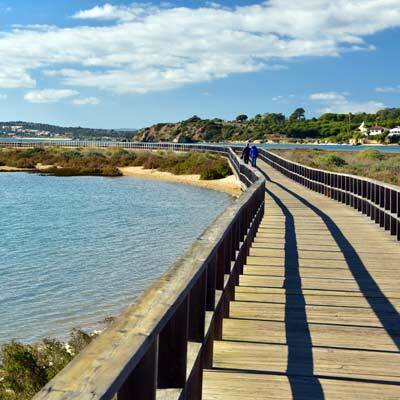 The town lies on the banks of the Alvor Estuary, overlooking the protected marshlands of Ria de Alvor Nature Reserve, while to the south is the Praia do Alvor, one of the largest sandy beaches of the Algarve. Alvor is a delightful town, with distinctively Portuguese appearance; there are traditional white-washed houses, narrow cobbled streets and small fishing boats pulled up along the banks of the river..
Alvor may be a relatively small town, but it contains a surprisingly large selection of restaurants, shops and late-night bars, all of which are found within the pretty historic centre. Alvor has a calm and welcoming ambience, and a favourite with families during summer, and retirees outside of the peak months. A holiday to Alvor is often focused around the beach, but there is a lot to see within the region, including the lively resort of Praia da Rocha, the historic city of Portimão and the Algarve’s famed waterparks. Alvor is a wonderful destination for a relaxing holiday, and this article will provide an introduction to the region. Why should I have a holiday to Alvor? 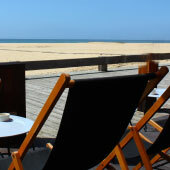 Alvor effortlessly combines all of the aspects needed for an enjoyable beach-based holiday. There is a vast sandy beach, the weather is always glorious, and the region provides exceptional value for money. Alvor boasts an extensive selection of modern hotels, authentic restaurants and social bars, while still retaining a traditional Portuguese charm about the town. Alvor benefits from being close to the central Algarve, with its buzzing holiday atmosphere and varied activities, but is sufficiently remote not to feel overrun with hordes of package tourists. The holiday activities found within the region include; boat tours, coastal hikes, golf courses, water parks, surfing and big nights out. The Algarve has a rich history, and this can be discovered by visiting the historic towns of Silves, Portimao and Lagos. 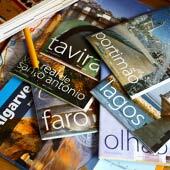 All of these towns can be easily visited as day trips, using the inexpensive public transport. Alvor is calm and low-key but they surrounding region certainly is not, and a holiday here can be peaceful or exciting as you wish to make it. Is Alvor right for me? 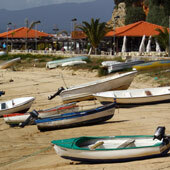 Alvor is suited for visitors who are looking for a simple, calm and inexpensive beach holiday. Alvor may not have historic monuments or a vast number of tourist attractions, but the town boasts Portuguese charm and a pleasant, laid-back ambience. Generally, Alvor caters for the slightly mature visitor, who does not want a town full of rowdy drunks looking to party all night long. As Alvor is less hectic than many of the other resort towns in the central Algarve, it is equally suited for families with young children. The Algarve is currently experiencing an unparalleled rejuvenation; new businesses are opening, hotels are being refurbished of and there is a sense of confidence and optimism about the region. Alvor is expecting an impressive summer season for 2019 and this follows the sell-out summer of 2018. This does mean that to secure the best prices, accommodation and flights must be booked far in advance. 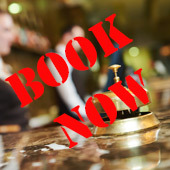 Our advice is, if you are seriously considering a holiday to Alvor book accommodation now as the best places will sell out, for a summary of the best hotels in Alvor please click here. 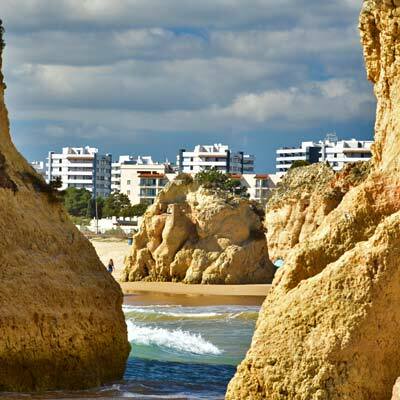 Alvor and the Algarve have long hot summers, pleasant spring and autumn seasons, and mild but unpredictable winters. July and August are the height of the tourist season and is when the sun is at its most intense. The weather in southern Portugal is suitable for spending time on the beach from mid-May through to the end of September. The best time of year to visit Alvor is during the spring or early autumn months, the weather is pleasantly warm but the region is not crowded with tourists. Alvor closes down for winter in October and reopens at Easter, during the closed season the town will feel very quiet as there is not a large permanent population or large ex-pat community. 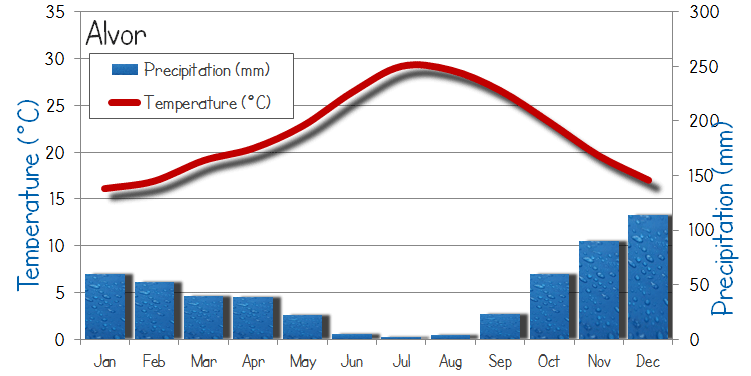 The sea temperature of Alvor is always cold, as the waters are fed by the Atlantic Ocean, not the warmer Mediterranean. Even in the hot summer months the sea water only reaches a chilly 20C, if you are planning to spend a lot of time in the water (surfing) bring a wetsuit. What’s the Best Attraction in Alvor? Alvor’s unique tourist attraction are the elevated walkways that cross the sand dunes and mud flats of the Ria de Alvor Nature Reserve. These pathways provide pleasant walks with scenic views over the estuary, which is a haven for bird life. The paths are wide enough to cycle along and have been extended eastwards along the beach. Does Alvor have good beaches? 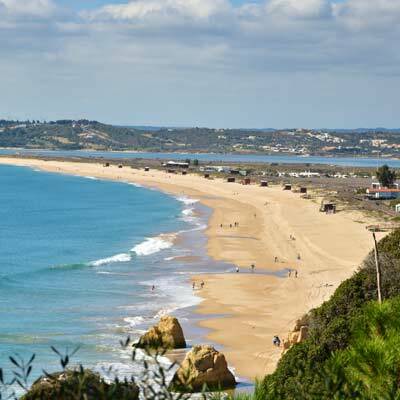 Alvor has a single vast beach that extends for over 3.5km, from the mouth of the Ria de Alvor in the west to the sandstone cliffs of Prainha in the east. This is a sandy beach with clean and safe seawaters, and is within walking distance of the town centre. The beach has a pristine appearance , as there is very little tourist development directly on the beach front, apart from the odd beach bar, restaurant and raised footpaths. Where are all of Alvor’s historic monuments? Alvor was originally founded by the Romans as a sheltered fishing port. The town later grew to became an important Moorish fortified town (known as Albur), which was conquered by King Sancho I and the Christian crusades in 1189. During the 14th century Alvor was strengthened to defend against pirate raids, and in 1495 the beloved Portuguese King, John II died in Alvor. With this extensive history you would expect numerous historic monuments, but the devasting 1755 earthquake complete obliterated the town. The only remains from prior to the earthquake are the foundations of the castle, which have been converted into a children’s playground. All of the churches were rebuilt and followed the Manueline and Rococo styles that were popular in the 18th century. 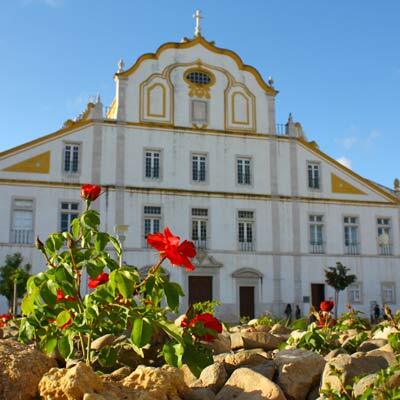 What are some of the popular day trips from Alvor? 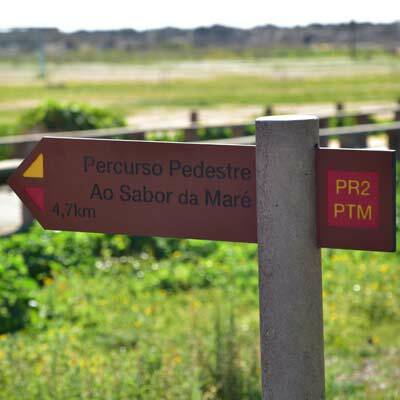 From Alvor it is very easy to visit the towns of Portimão and Praia da Rocha, as these two destinations are connected by the inexpensive local bus network. 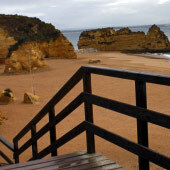 Praia da Rocha is a busy and hectic resort town that is situated on a beautiful beach. This is the place to head to for a big party night out, as the town is crammed full with themed bars and late night venues. Portimão is a large residential city that offers a scenic harbour, good shopping, and a chance to experience typical Portuguese daily life. Portimão is a major transport hub and from here it is possible to catch further buses to the historic towns of Silves and Lagos. Silves was the ancient capital of the Algarve and contains the Algarve’s best-preserved castle along with other monuments that reflect the once importance of the town. Lagos is a much larger city and was the centre for Portugal’s glorious 14th century age of exploration. Lagos’ attractions including a fort, city walls, decorative churches and even a former slave market. Within walking distance of Lagos are the highly weather cliffs of the Ponte da Piedade, which are regarded as best natural feature of the Algarve. The main international airport is Faro airport, and this is located 70km to the east of Alvor. Faro airport is a major international airport and has direct flights covering the whole of Europe. 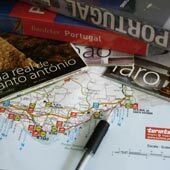 All of the major low-cost airlines fly into Faro, which can provide great value flights, if booked far enough in advance. 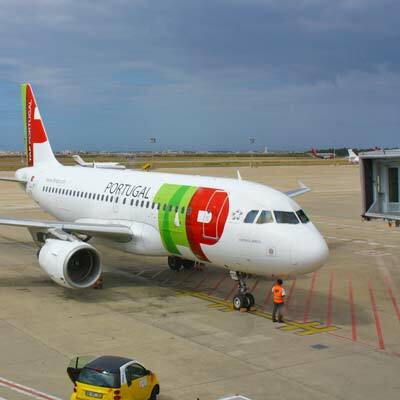 For the onward connection from Faro airport to Alvor, it is recommended to pre-book a transfer as the journey by public transport is difficult and time-consuming. 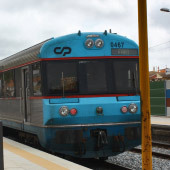 The route from Faro airport to Alvor by public transport requires two buses and one long train journey and, depending on connections can take more than four hours. 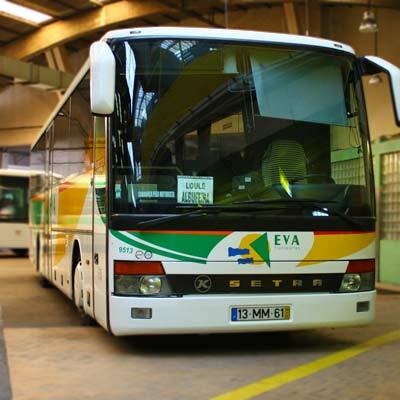 Private transfer range from €70-80 while a shared transfer by coach will be around €20-30 per person. If you are in a large group, it is often more cost effective to hire a private transfer. A taxi hired from Faro airport will be significantly more than a private transfer. Related articles: Faro airport to Alvor. •	The town has a calm atmosphere and is family focused. •	The beaches are safe, with clean and calm sea waters, which are supervised in the summer. •	Supermarkets stock all common items, and pharmacies are widely available all minor ailments. •	English is widely spoken by all who work within the tourist industry, language will never be a problem. •	There is a wide selection of rental apartments and holiday homes, ideal for self-catering holidays. A rental car is not needed for a holiday to the Algarve, but it does make exploring the region significantly easier. 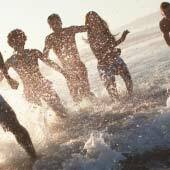 If you intend to solely have a beach holiday, with a couple of day trips to Portimão or Praia da Rocha then a rental car is not needed and will be more hassle than it’s worth due to the limited car parking in the centre of Alvor. 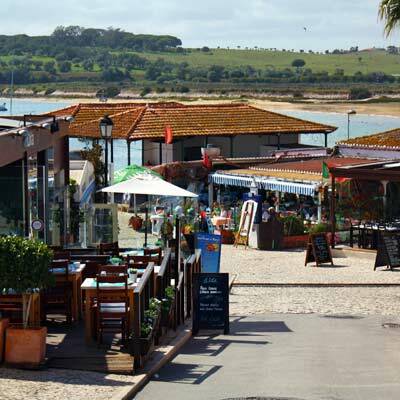 There is a wide selection of restaurants in Alvor, that cover all styles of cuisine and dining. Restaurants include Portuguese, English, Indian, Chinese, Italian and Spanish. Eating out is significantly cheaper than back at home and the evening meal is an important part of the Portuguese day, therefore meals tend not to be rushed. Portugal is a comparatively inexpensive country; with food, accommodation and transport much cheaper than many of the other established holiday destinations, especially when compared to Greece, or the Balearic islands. Will language be a problem in Alvor? Everyone who works within the tourist industry speaks English fluently and English is the second language used in the Algarve (in the airport, on buses etc). All restaurants will have English menus.